"A young man was sitting peacefully on the river bank and sharing his breakfast with the MALLARDS, who were overjoyed by this unexpected food supply. They stood around him, waiting patiently for an other morsel coming in their way. The RED-throated LOON swam close to the shore, clearly interested in the MALLARD scene. "Another young man showed up with his dog. 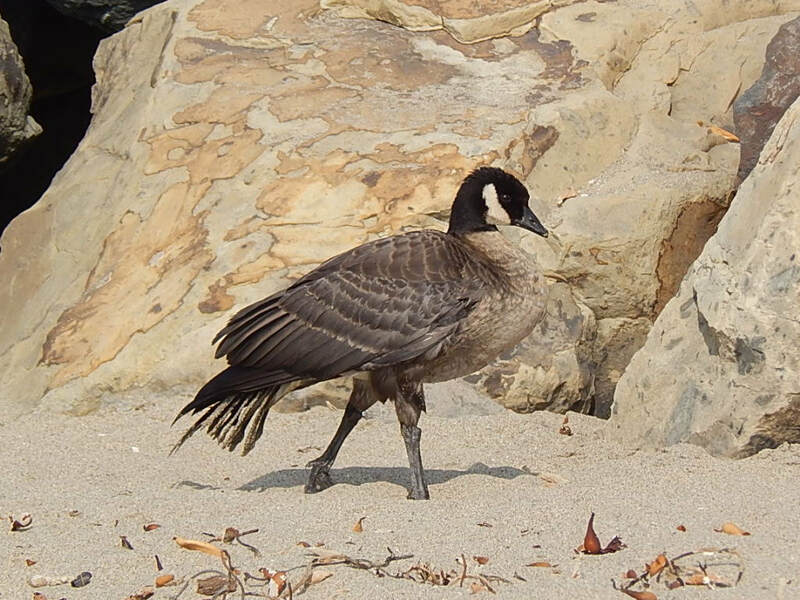 He unleashed the look-alike wolf, who couldn’t believe its luck: MALLARDS nearby on the shore. 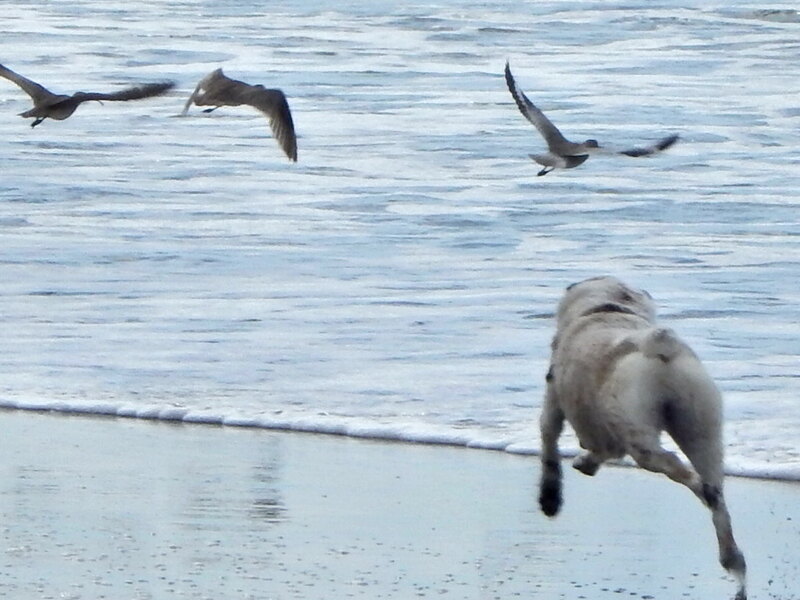 The dog took off lightning fast, aiming for the breakfast eaters, who couldn’t believe their eyes while they were gauging if this was really true: a dog on the loose, racing straight at them. They decided that a peaceful meal had turned into hell and exploded into the air to land on the water. 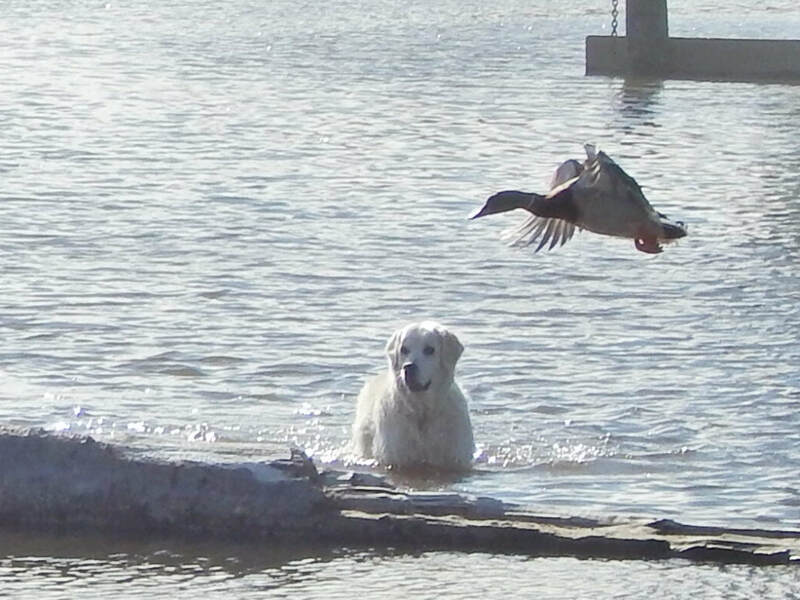 "The breakfast benefactor yelled at the dog owner, whose dog was chasing the MALLARDS in the water. The RED-throated LOON dove down and re-surfaced at a safe distance. 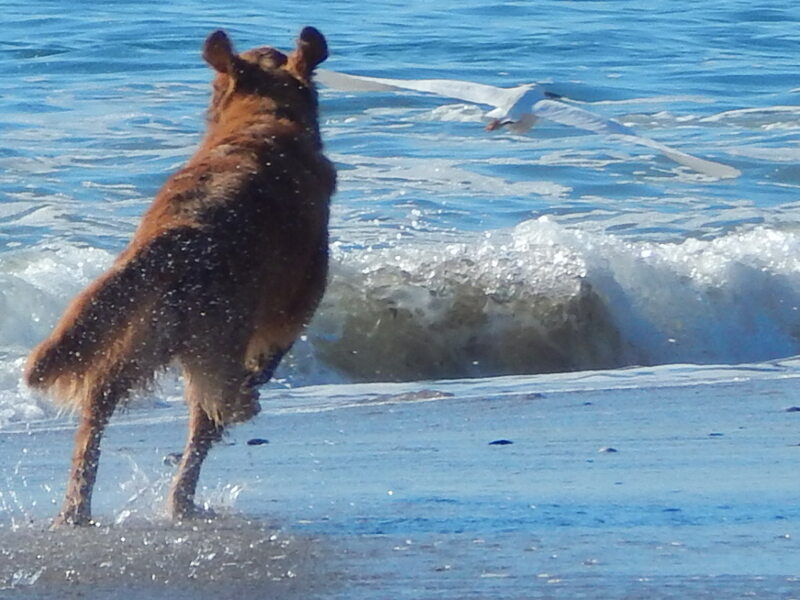 It became obvious that the dog was on fire with hunting fever, ignoring the helpless master’s calls, chasing after every bird in sight until land and water were feather empty. It took a while for the owner to get hold of his dog and as they left the previously peaceful man tasked the other man to become a responsible dog owner with some peppery comments." A couple came to the beach with two large dogs. One black and one white. Two ducks were sitting on a log in the lagoon area of the beach. 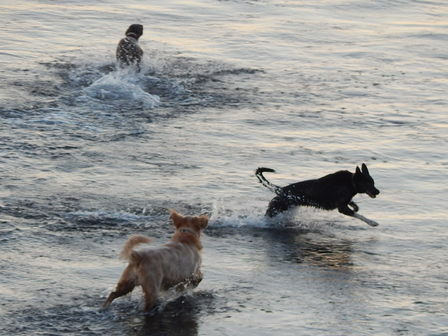 Both dogs ran into the lagoon water. 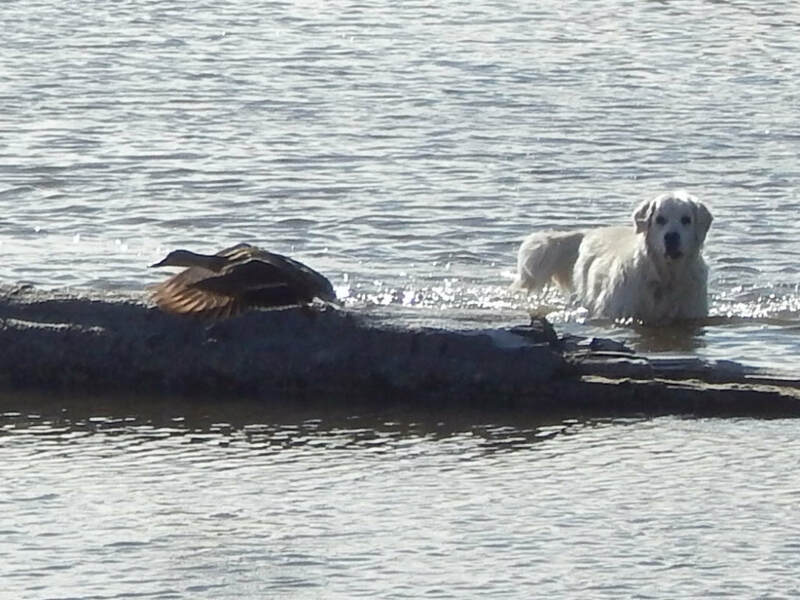 The white dog approached the the ducks from the apartment side. The black dog from the killdeer area. The black dog made the ducks fly before the white dog got to them. 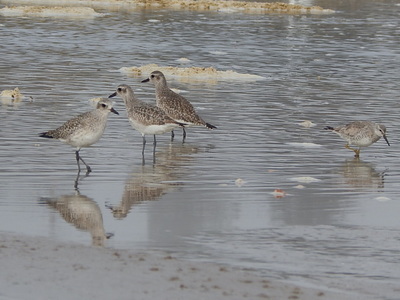 The same couple came to the beach the next day. The dogs looked for the ducks, but there were none. 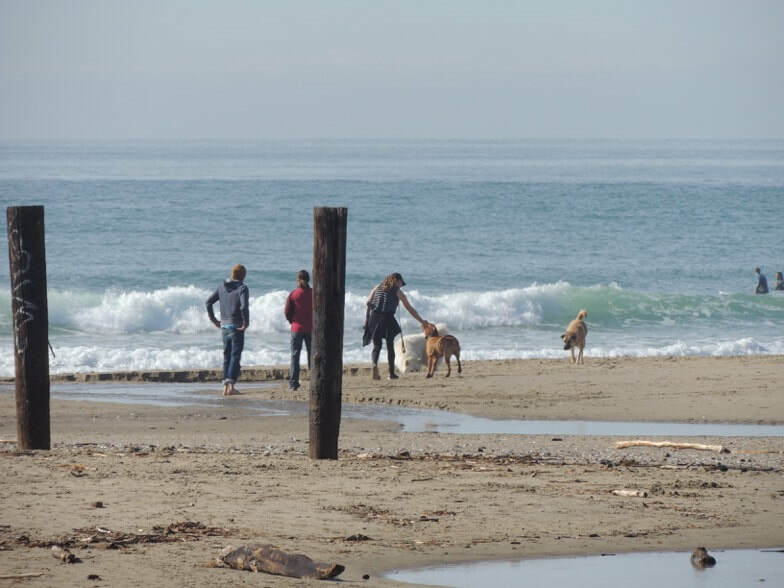 At 11:30 am there were eight unleashed dogs and one on leash with seven dog owners at Corcoran Lagoon Beach. 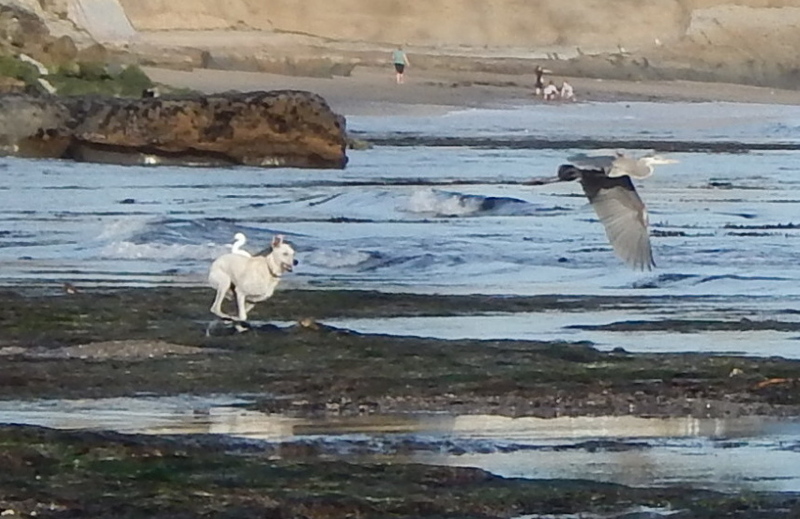 One lone Snowy egret, attempting to feed at the shoreline, constantly took wing to evade dogs chasing it. When asked to leash their dogs, on owner ignored the request with the comment "I pay taxes and I live across the street." One wonders if paying taxes relieves citizens of the rule of law. This Cackling Goose (Branta hutchinsii) was first seen by the photographer floundering away from an unleashed dog. 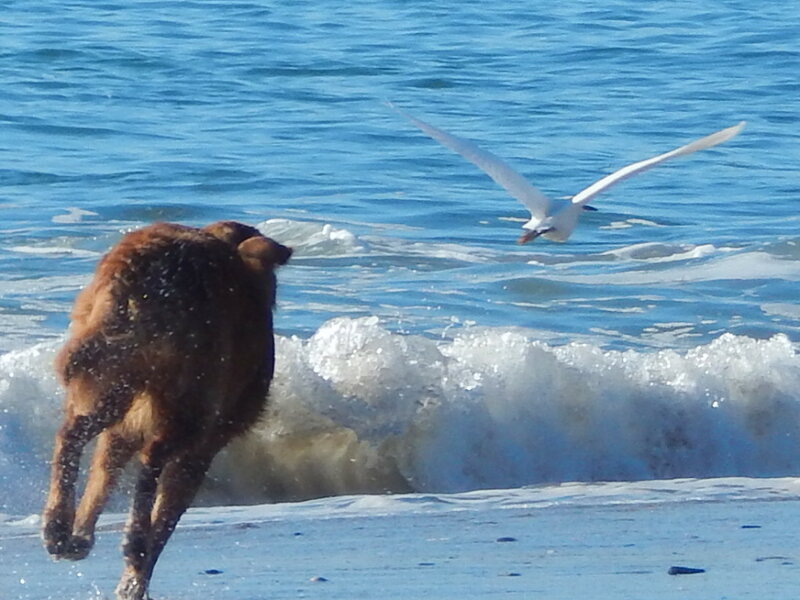 It had been seen earlier being chased into the water by another unleashed dog. Numerous people reported the bird in distress to Native Animal Rescue, including a sheriff's deputy. 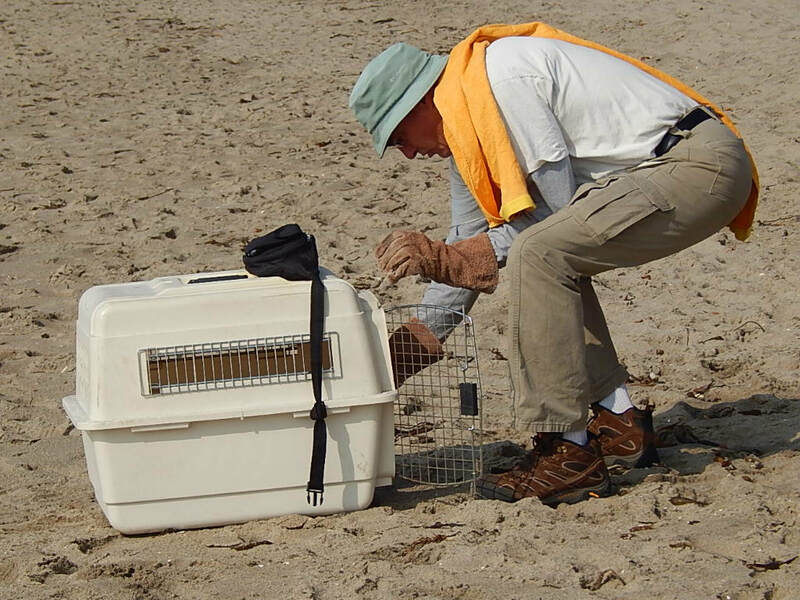 Thanks to Native Animal Rescue and everyone else who participated in its rescue. May it heal of any wounds and be returned to the wild. May all dog owners learn to stop violating the County Leash Law and keep their dogs leashed when they are in wildlife habitat. 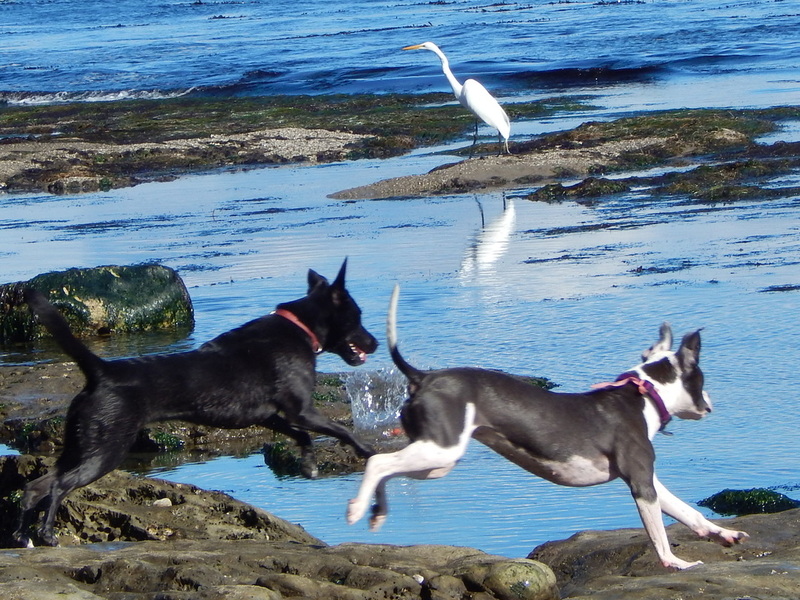 County beaches are not designated as off-leash playgrounds for dogs! 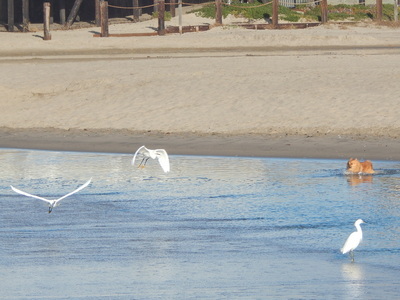 Since the lagoon has resealed at the east end of Corcoran Lagoon Beach, a number of egrets have gathered there. This morning Keith went down there at 10:25 am to photograph them. No egrets. This evening another photographer sent the following three pictures, taken at 8:19 am. She said that the unleashed dog chased the birds for almost an hour. The owner showed no remorse. 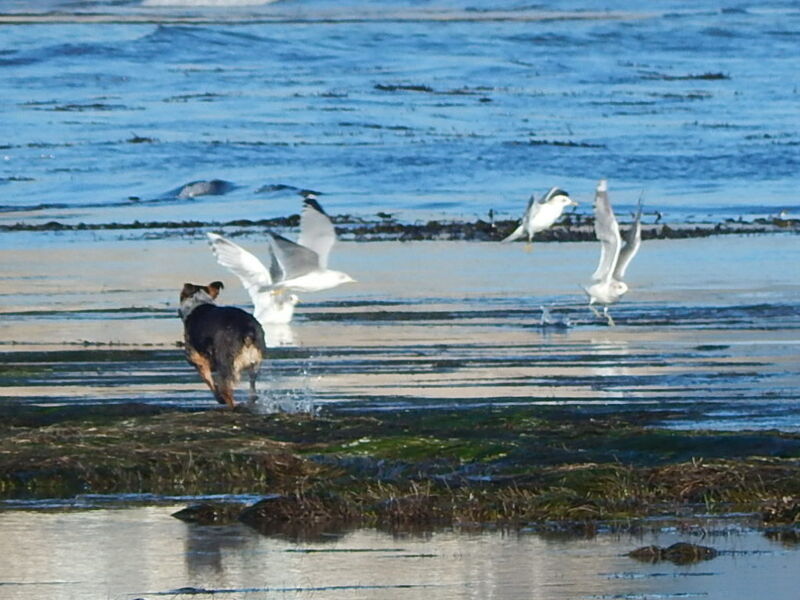 2016-2017 saw a repeat of migratory shorebirds being chased by dogs. Happens every day. How many pictures do we have to publish in order to document this situation? How many reports like the following are necessary? 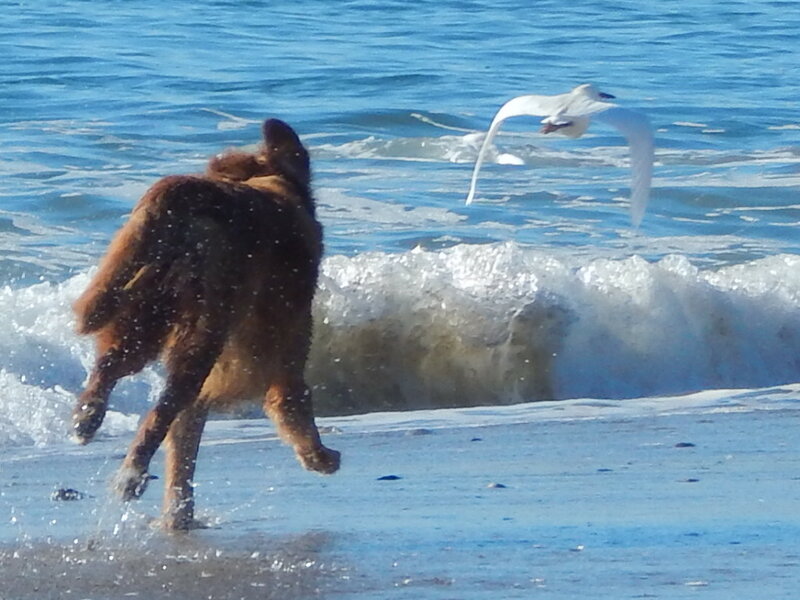 Birds trying to feed, to gain strength for their migratory journey, were chased by an unleashed dog this morning. 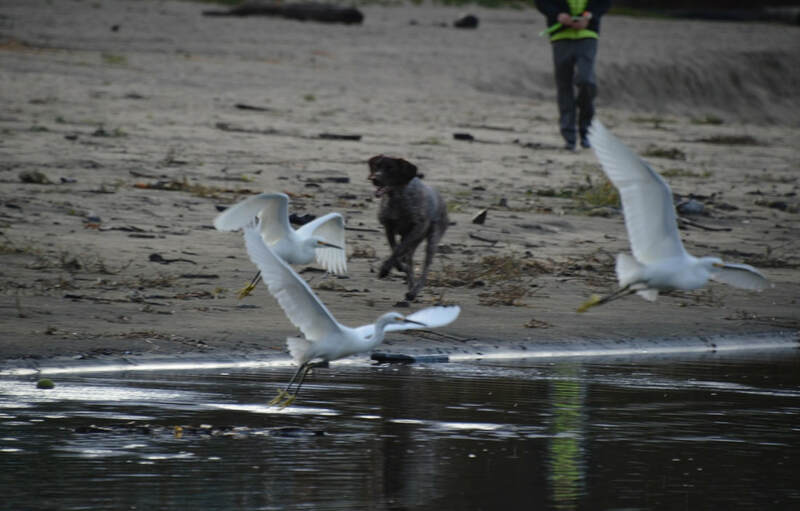 This is a constant problem at CLB, as dog owners continue to not understand how their dogs cause disturbance and stress to birds trying to rest an feed along the shoreline. Do these dog owners care? Apparently not, by their words and actions. 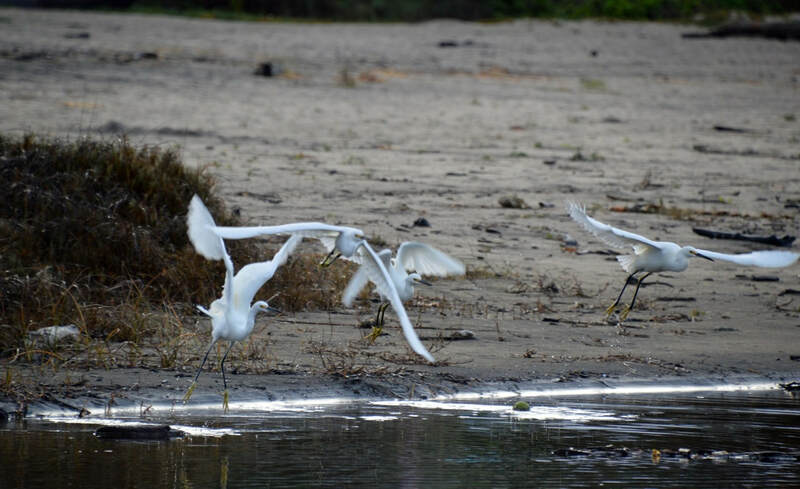 Beautiful egrets at the shoreline. Then the dog owners began showing up from the 26th Ave. direction - mostly women. I saw a group of 6 people with 6 dogs, one woman with two dogs. 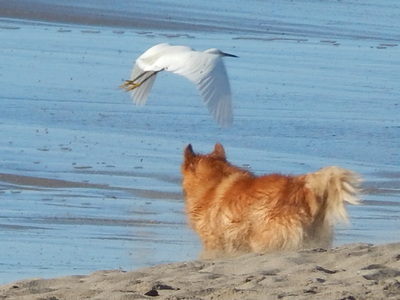 I saw those 2 dogs chase the egrets. 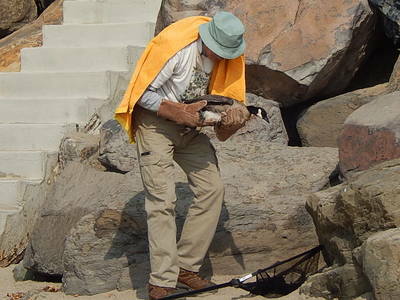 The woman called them back to the surf line, but the damage was done. A little after 10 I saw Kristin D. on the beach with her dogs off leash. Birds gone. Eight dogs off-leash this morning. 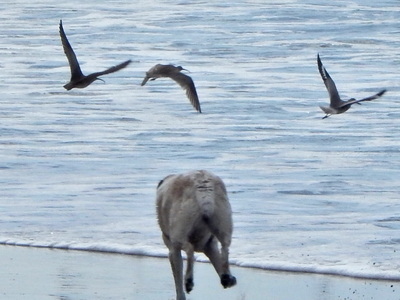 One woman's golden retriever chased a few of the Whimbrels trying to feed at the shoreline. I turned around to wait for her to catch up, but she could tell that I wasn't happy and leashed the dog and herded it off in the other direction. Shows people know the rules but just could not care less. 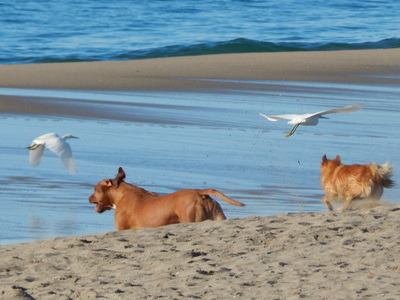 This morning, a couple came on to the beach and unleashed their dog. 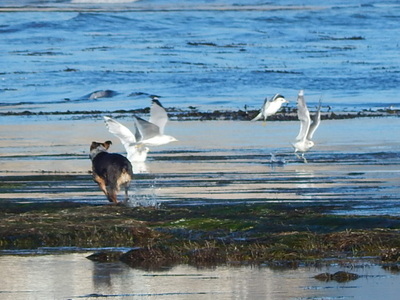 The dog chased birds for three or four minutes. They called their dog several times, but it did not respond until all the birds had flown away. 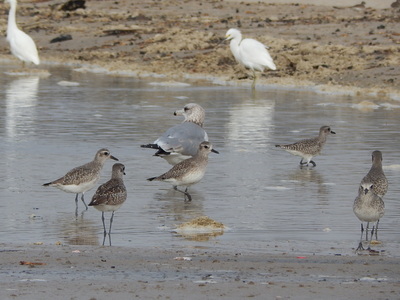 There were at least three species, small sanderlings, Whimbrels or Willets and a Marbled godwit -- all scattered by the dog. This morning, the black dog in the picture below chased every bird visible in the picture. 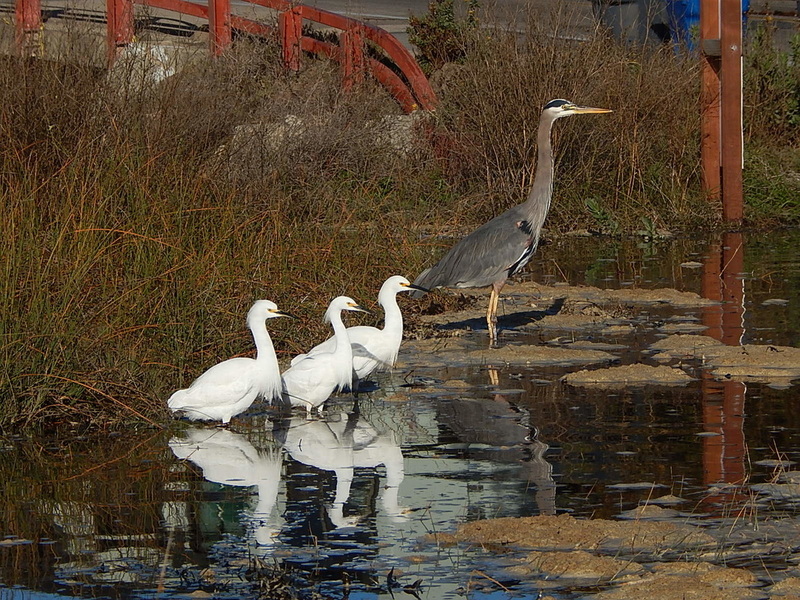 Egrets, ducks, seagulls, everything. The dog belonged to the woman in the background with her arms outstretched. Her walking partner also had an unleashed dog. 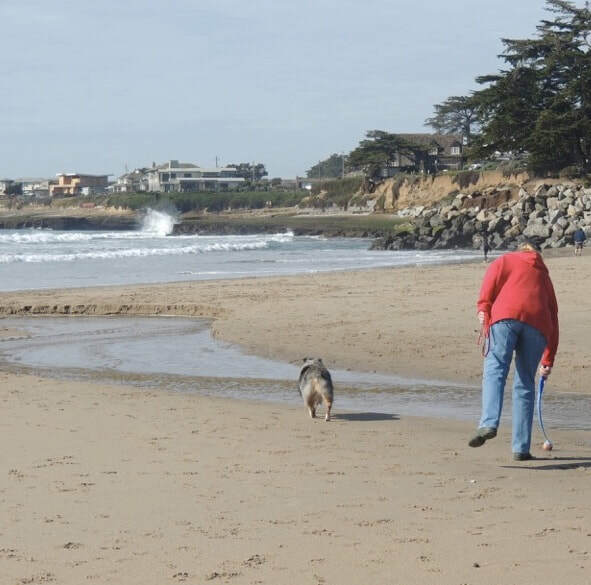 After the damage was done, they both leashed their dogs and left the beach. Shorebirds feeding and resting along the lagoon outflow at Corcoran Lagoon Beach were flushed by an unleashed dog, which raced into the water. The dog's owner said "Sorry about that." 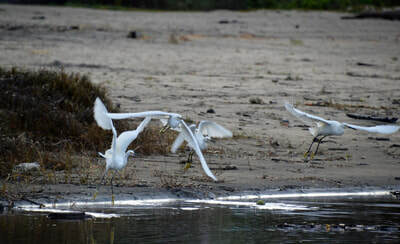 Only the egrets returned...eventually. 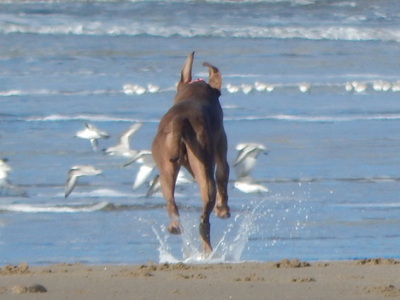 In the beach area to the west of the lagoon, a dog owner threw a ball for her unleashed dog right at the birds, making them fly. 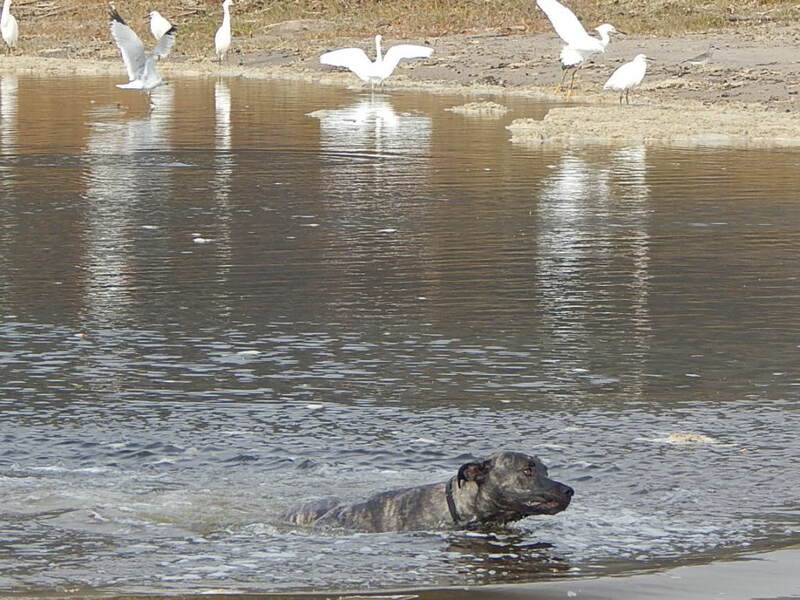 Then she crossed over to the east side of the lagoon, where she deliberately threw her ball two more times at the birds. 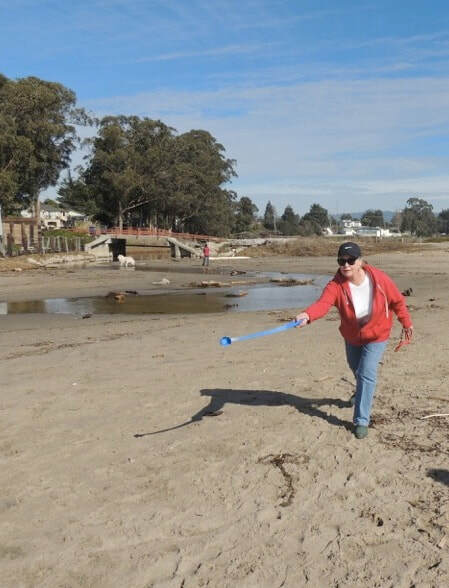 Another dog owner, with two dogs, entered the beach from the east access from E. Cliff Dr. She unleashed both of her dogs. 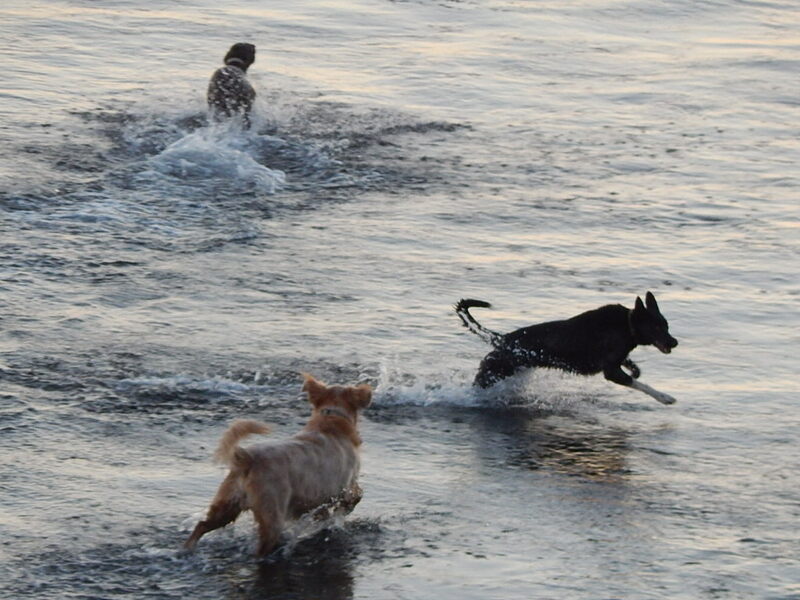 A fourth dog owner, with her two unleashed dogs, came onto the beach. This dog owner was actually trying to get his dog to chase a bird that was resting on the sand. Fortunately, he was unsuccessful as the dog was more interested in playing with three other off-leash dogs that were near by. 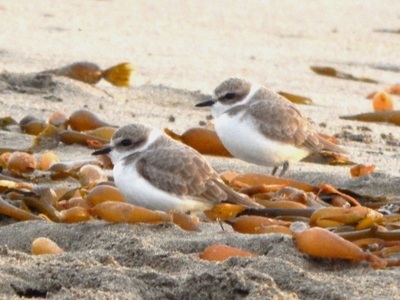 Snowy Plovers at Corcoran Lagoon Beach! Just before sunset of the same day, these two endangered Snowy Plovers (Charadrius nivosus) were seen at the tide line of the eastern end of CLB. Unfortunately, they were flushed by an unleashed dog, expending precious energy. Another dog owner, who had leashed her dog said "I see them out here every winter." Another Snowy Plover was photographed at Corcoran Lagoon Beach this past spring (4/6/15). 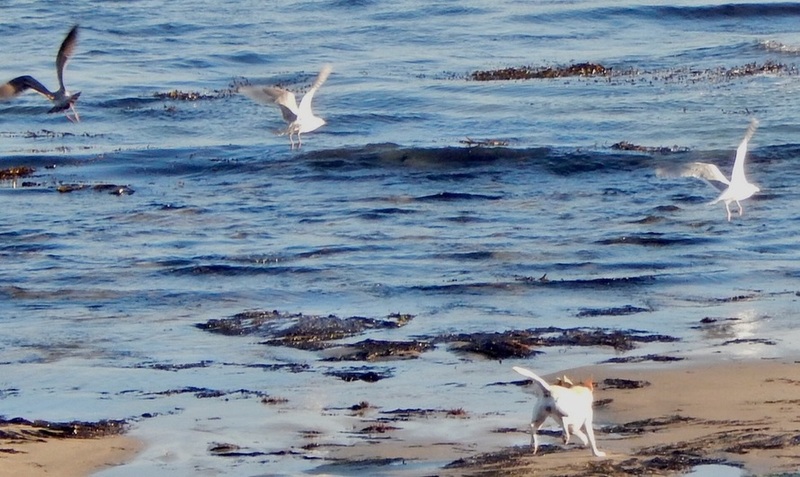 At 9:00 am I was taking pictures of Egrets, when all of a sudden they took flight, the result of being chased by these two small unleashed dogs. Next the dogs ran over and began barking at me. Next, still unleashed, the dogs went over and began barking at a couple that was laying on the sand. The couple got up and left the beach. As the dog owner walked past me to retrieve her dogs, she said to me "They've never done that before." The whole thing was witnessed by three others. These dogs are off-leash other places besides the beach. 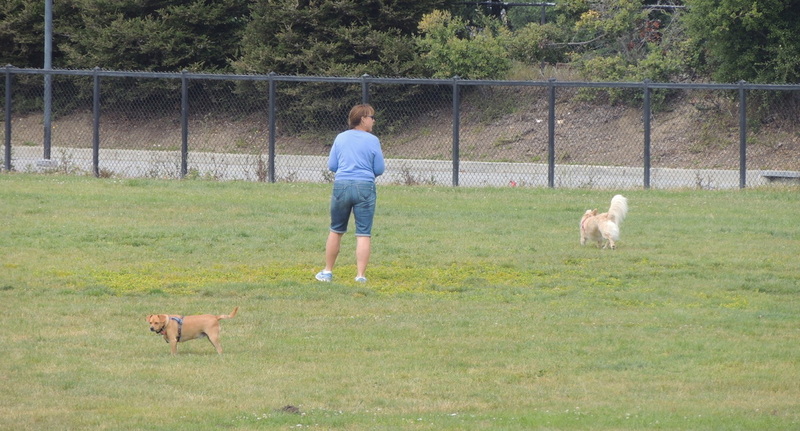 The following picture was taken April 19, 2015 at the Shoreline Middle School playing field, where there are two signs that say No Dogs Allowed on Field (whether they are leashed or not). The dogs were observed at the school playing field again on November 29, where the fastest unleashed dog chased birds (Seagulls and Killdeer). Owner and dogs proceeded to the Twin Lakes State Park (posted Dogs Must Be ON Leash), where the dogs were unleashed once more. There were forty birds in the lagoon outflow, until two unleashed dogs entered the water, causing the birds to fly away to seek refuge across E. Cliff Drive. 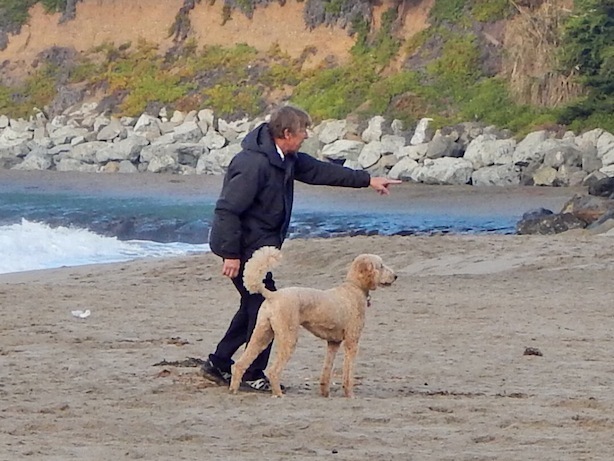 Another dog owner was seen scraping sand over his dog's excrement. 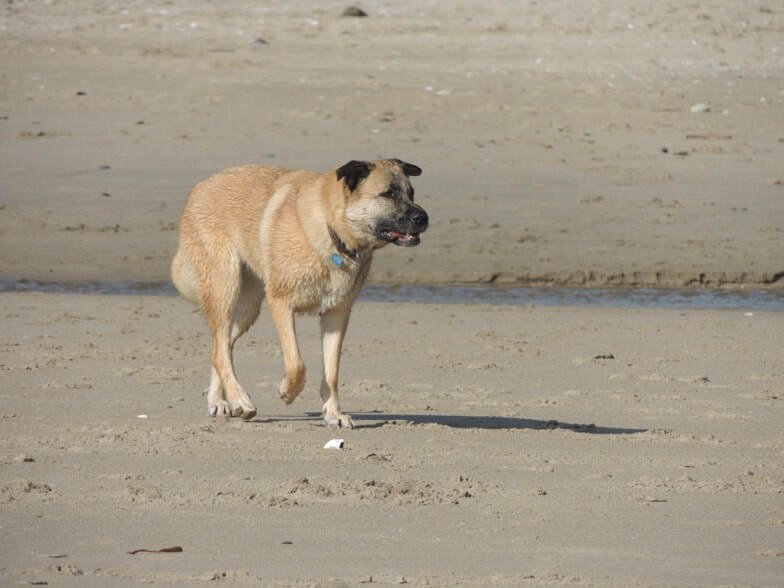 Another incident occurred when a woman with a leashed well-behaved pit bull breed dog entered the beach. When the woman was 150 feet from the shore another unleashed dog ran toward the pit bull. Both dogs danced around the woman entangling her in the extended long leash. This happened nine times. The owners of the unleashed dogs were calling their dog the entire time, but the dog wouldn't respond. After the sixth time the pit bull looked at the owner and waited for the other dog to charge for the seventh, eighth and ninth times, finally snarling, that he'd had enough during those last three charges. The owners retrieved their dog after the ninth charge. 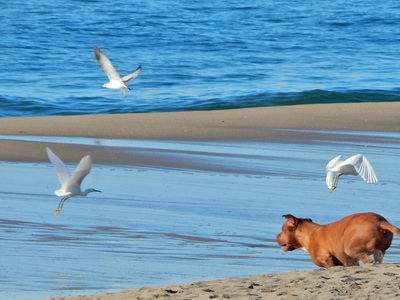 So much for the pit bull's owner's nice walk on the beach. 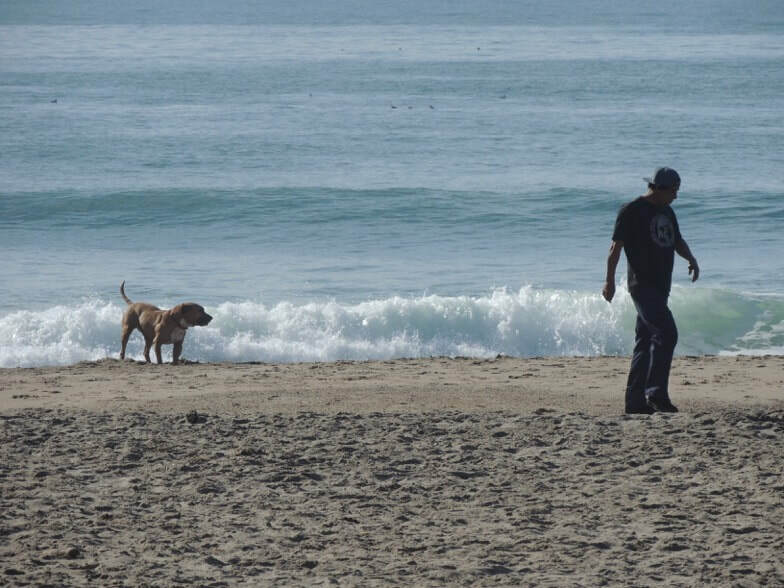 I went over to 12th Avenue (State Beach), just in time to see a man walking with his unleashed dog 80 feet behind him defecating on the beach. The owner was unaware of what was happening behind him and of course did not pick it up. At sunset I checked the the 32nd to 36th Avenue Beach. That was a shocker. 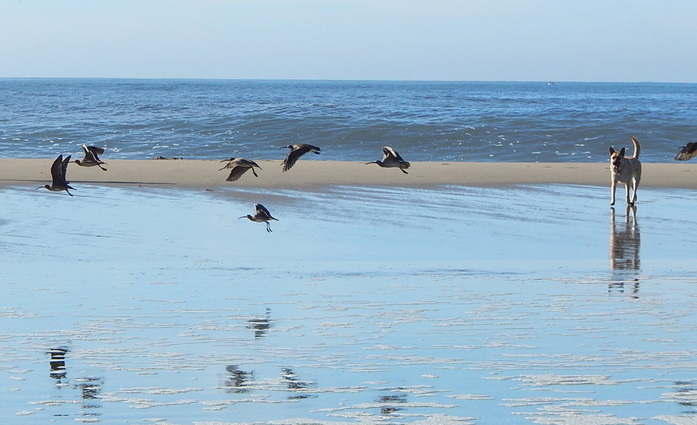 It was low tide and birds were trying to land to feed. 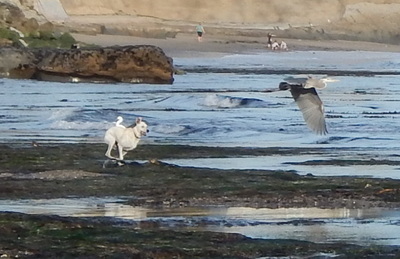 Three Egrets and a dozen or so Sanderlings were chased for twenty minutes by four dogs. The birds would land at 32nd and get chased off by the dogs. 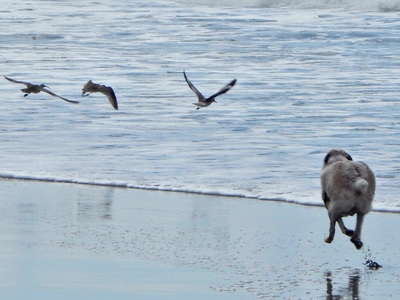 The birds would then try to land at 36th, to be again chased by the dogs. This was repeated many times. 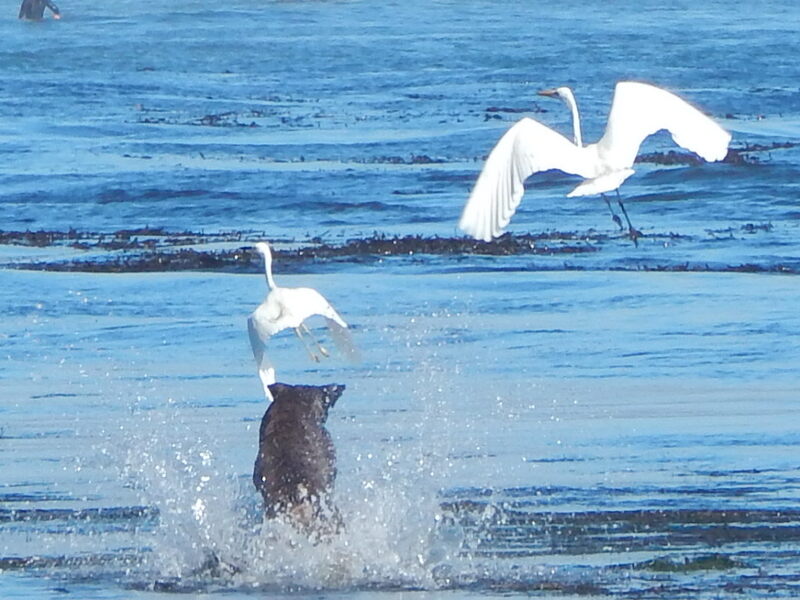 So much for the Monterey Bay Marine Sanctuary. 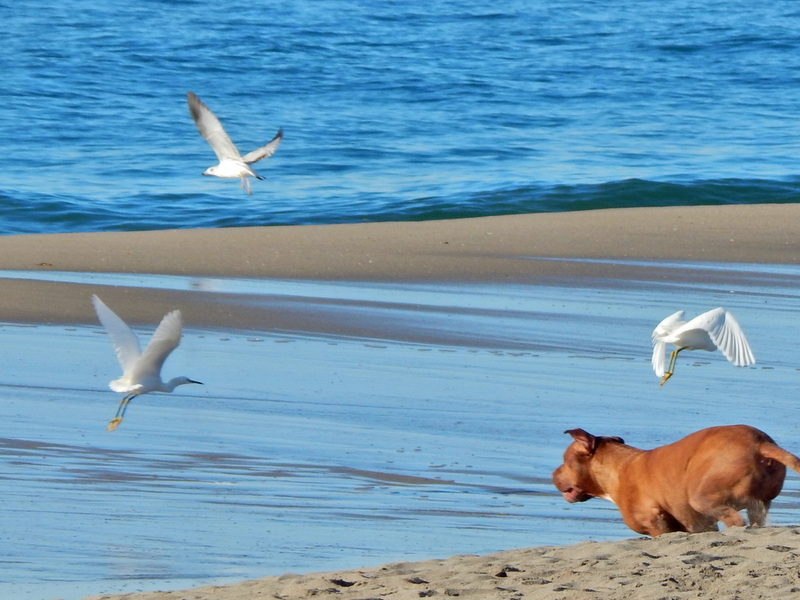 11:00 am A woman entered the beach from E. Cliff Dr. with two unleashed dogs, one of which immediately chased after the egrets in the lagoon outflow. 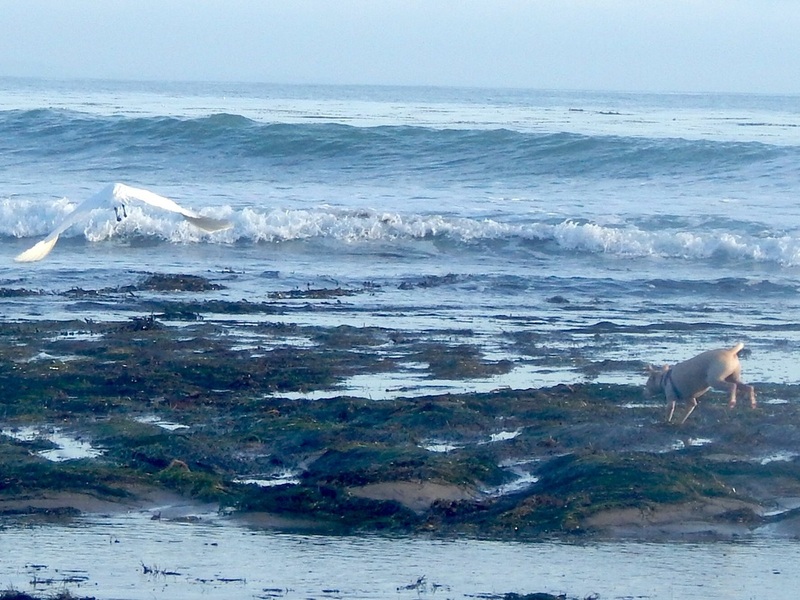 The dog then chased the Surfbirds, a Whimbrel and several Willets feeding at the shoreline. A man who watched this happen said he was going to have a word with the dog owner. I don't know if he did, but she left the beach shortly there after. 4:20 pm This was the third chase for this dog. 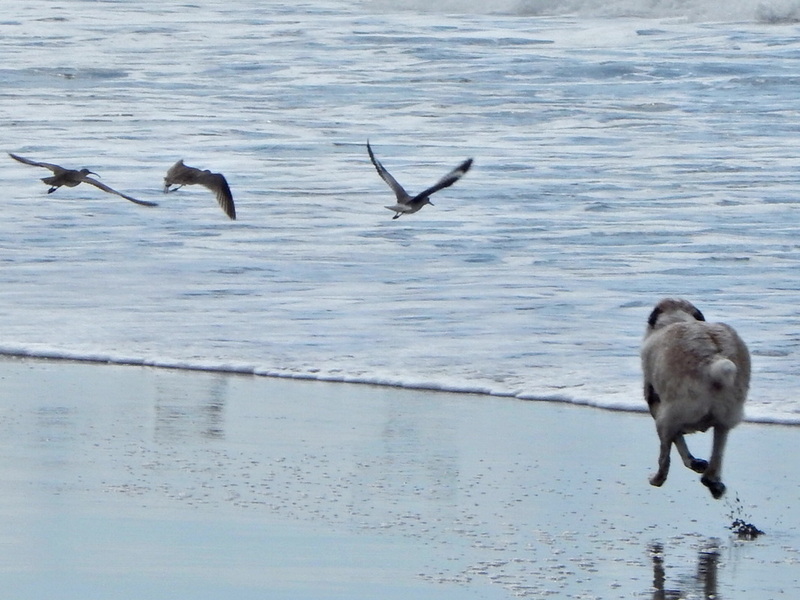 Entered the beach at 32nd, chased birds there, again between 32nd and 34th and then this chase pictured. Dog's owner was heads down in her smart phone and saw none of the chases. Photo taken at 3:00 pm on Sunday. 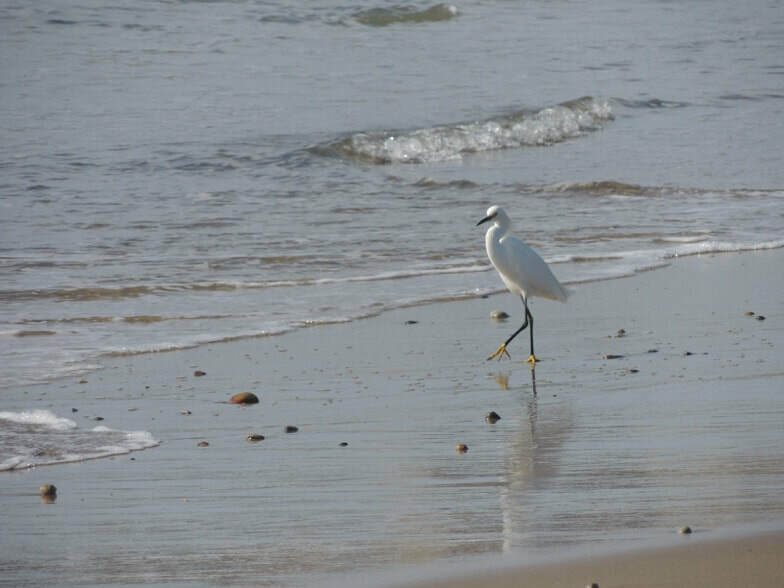 Does the egret stand a chance? Do the mindless dog owners who throw balls for their unleashed dogs have a clue? 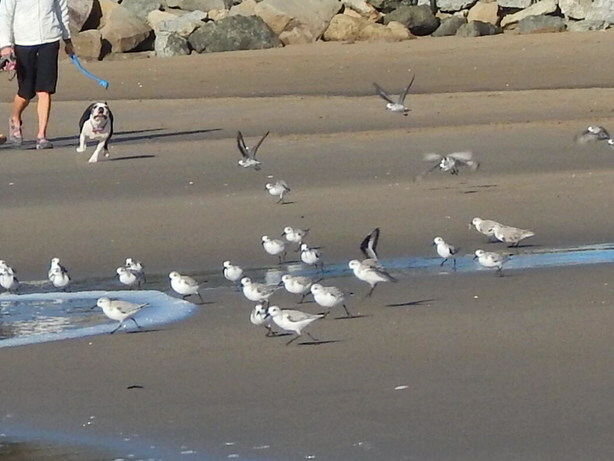 4:30 pm Since Animal Control officers can't be on the beach all the time, this dog cleared the birds out at 32nd, then chased all the birds off between 34th and 36th. 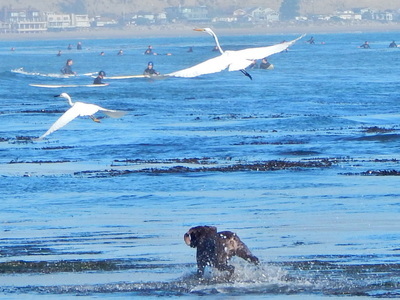 This pelican was chased off by unleashed dogs three times in one hour. Picture taken at 32nd Ave. beach at 5:02 pm. 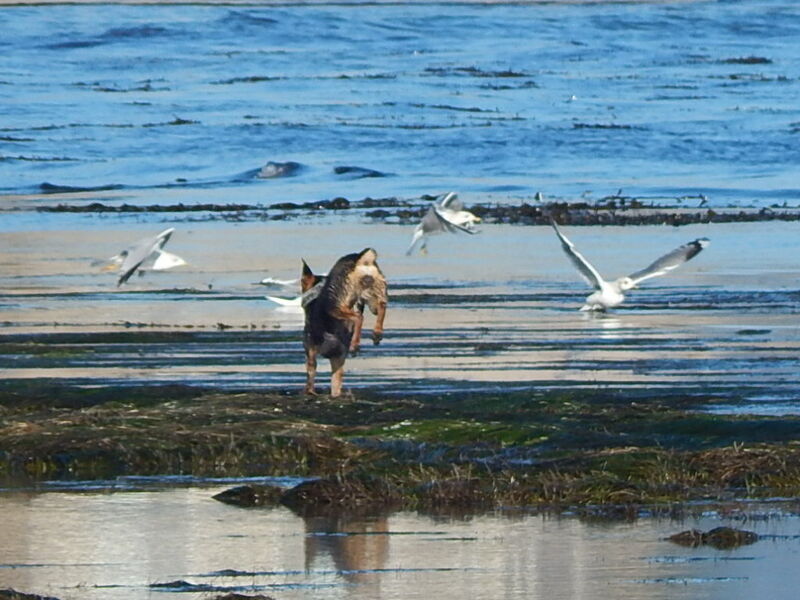 From an observer: "I think it is very wrong that people run their dogs off leash at Pleasure Point, the only good size reef area in mid county where birds can feed at low tide. It is criminal that they are denied that by dog owners." 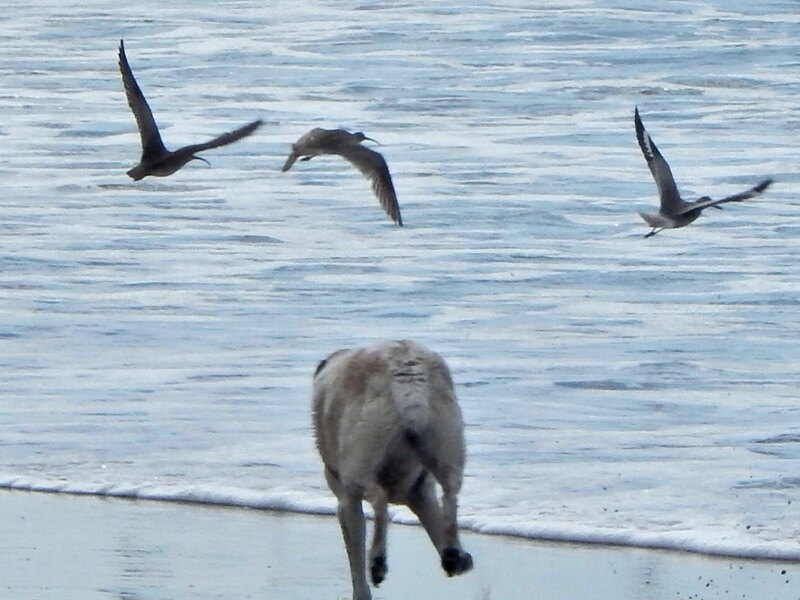 A dog owner, violating the County Leash Ordinance, allows this unleashed Queensland heeler to chase birds at 34th Avenue beach (3:20 pm). 34th Avenue beach at 2:50 pm. 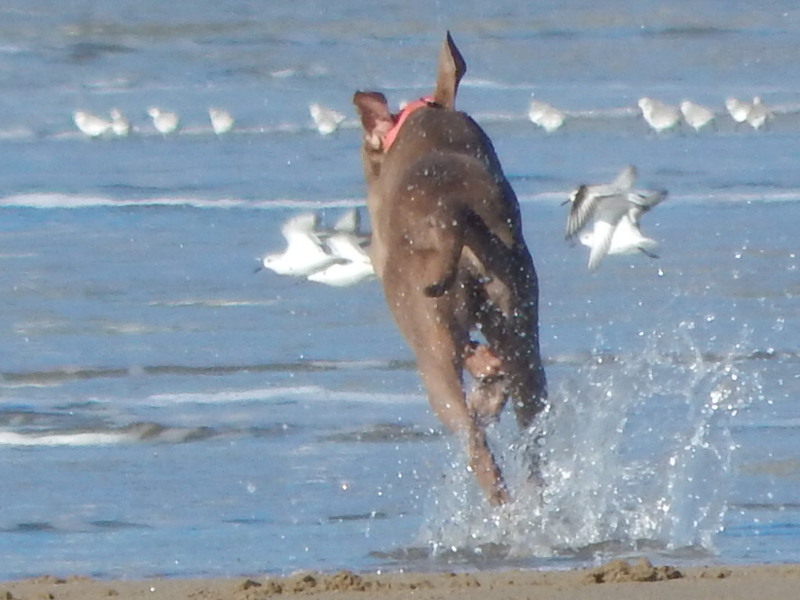 This dog is real a bird dog. 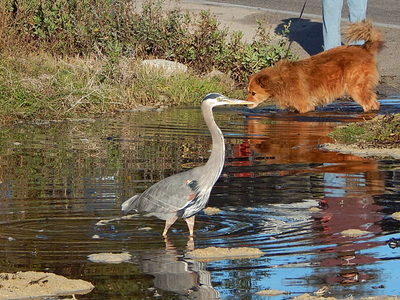 It stalks the birds before attacking. I've seen it stalk small birds that people down there don't see. 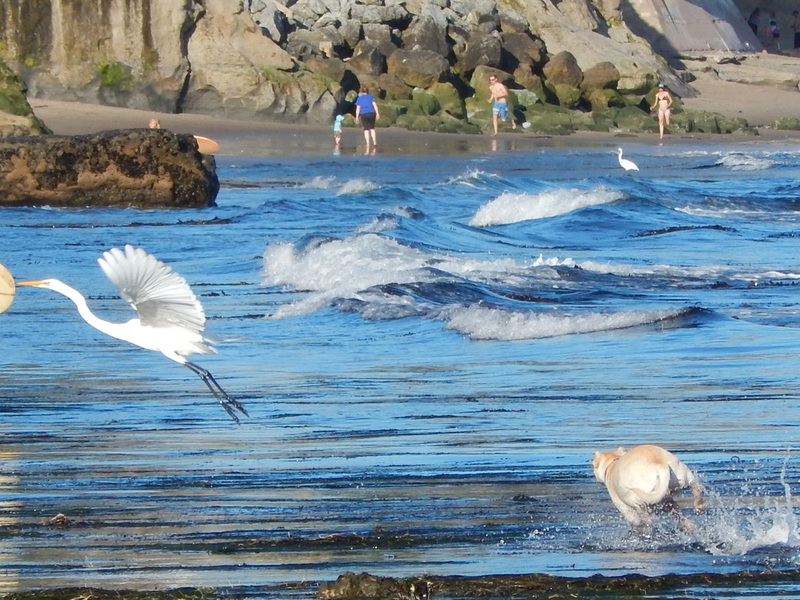 These egrets were fine even when the surfers put in near them. Only the charging dog caused them to fly away. unthinking man who threw a ball for his dog. 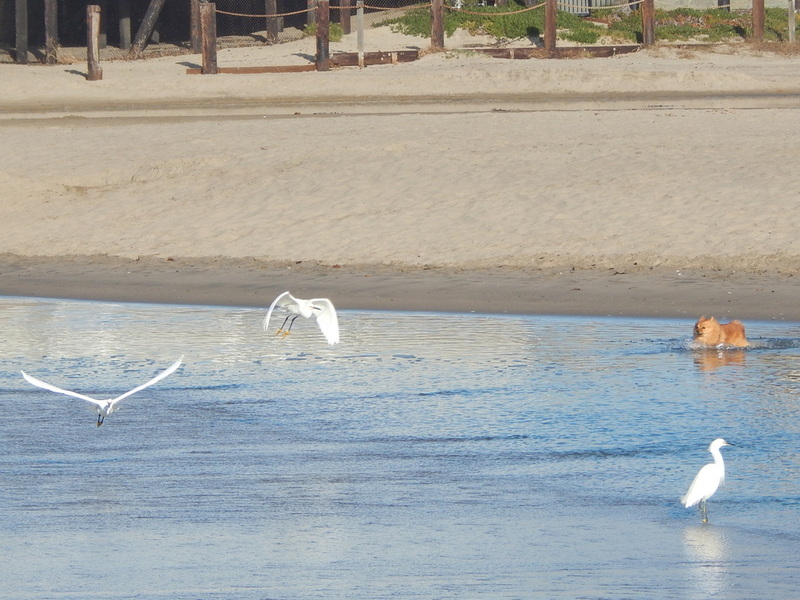 Six Snowy egrets enjoyed the shoreline of Corcoran Lagoon Beach from 9:45 am to 10:33 am. They were not bothered by walkers, who carefully passed them. 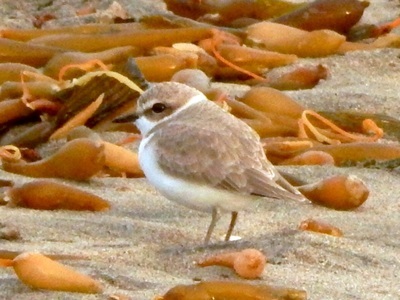 People and wildlife sharing the beach. 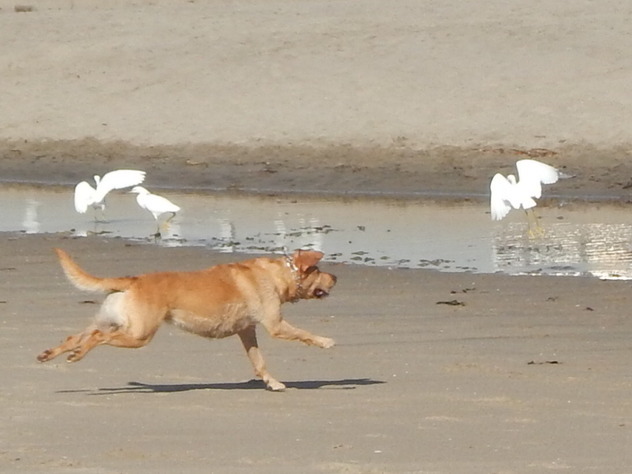 At 10:33 the unleashed dogs arrived and harassed the birds for 8 minutes, finally chasing them away for good. 4:30 pm Unleashed dog chases Great Blue Heron from its feeding spot at at Pleasure Point Beach (34th Avenue). violating the leash law, have any clue or do they think birds enjoy being flushed by predators? 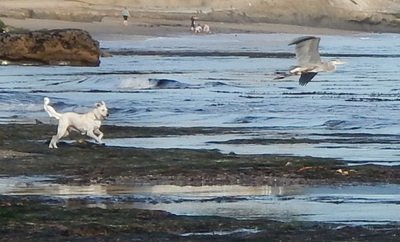 11:48 am Harassment of wildlife on the shore of the National Monterey Bay Marine Sanctuary by unleashed dog. These pictures taken at the end of the Corcoran Lagoon outflow. Constant harassment allowed by dog owners. violation of the leash law, to put some teeth into the consequences of destroying wildlife habitat with domestic pets. I was walking on E. Cliff watching unleashed dogs at low tide going nuts on birds. 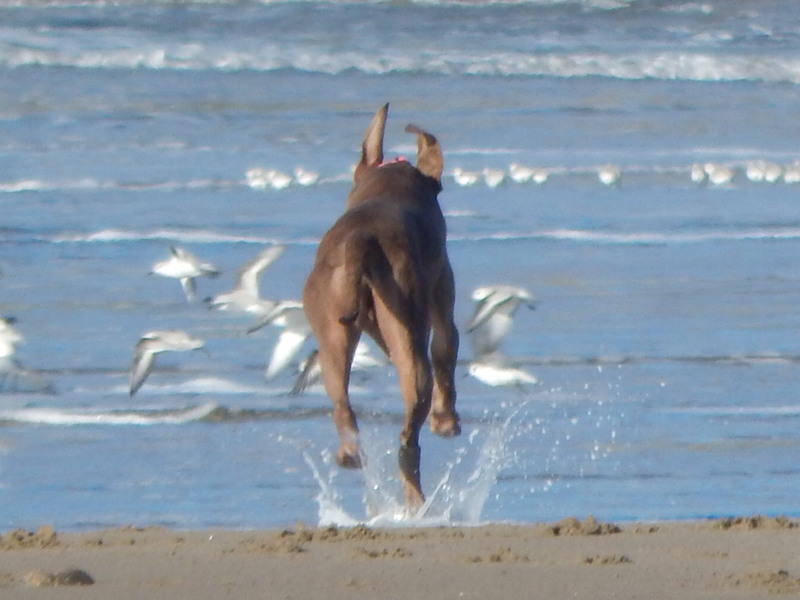 I overheard two men talking about the dogs chasing the birds and then about the controversy regarding off leash. One man was pro off leash. When I talked about birds not feeding and children running he said "yeah, kids shouldn't run from dogs because the dogs go for the back of the neck." He said that three dogs chased and bit his son in the back of the neck at the beach long ago. When I asked why then he doesn't support the leash law he said his children were grown now and he doesn't care. I told him I did because they chase my grandchildren now. He was unmoved. Properly leashed dogs are less of a threat to some birds.